The AURA-8800 is a high performance model with printing speed up to 220 mm per second. As a receipt and information printer, its speedy printing satisfies crowded check-out line and promotional activities in the peak hours. Optional spill-resistant top cover displays thoughtful design for retailers to run their business smoothly even in the harsh environments like pub, bar, etc. 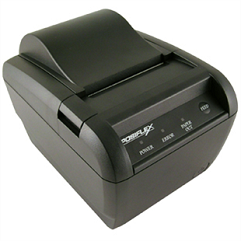 Additionally, the AURA-8800 features easy paper replacement and flexible deployment in the wall-mount design.